Food, friends and eclectic activities made Reunion 2007 a hit for Kellogg School alumni and their families. Among the highlights of the May 4-6 celebration was the annual Reunion barbecue, held in Deering Meadow, adjacent to the Kellogg School's Donald P. Jacobs Center. Some 800 alumni and their families gathered there May 5 to enjoy an afternoon with Kellogg friends. 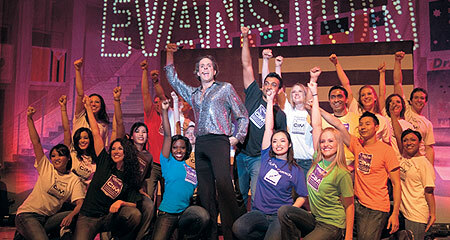 Throughout the weekend, nearly 1,600 registered alumni and guests — a new record — returned to Evanston. They came from as far away as Tokyo and the Czech Republic to reconnect with Kellogg. Music spilled from the large white tent at the center of the celebration where alumni mingled, while around the perimeter bunches of brightly colored balloons swayed against a backdrop of black-and-white photos from facebooks past. Outside, groups gathered on the lawn while children wearing elaborate balloon hats ate ice cream sandwiches. Linsey Simpson Gallagher and Danyue Chen (both '02) and their husbands updated one another on life after Kellogg. "Time flies," said Chen, now a brand manager for Ziploc at SC Johnson. "After five years, you still recognize people." Some attendees had been out of school a bit longer, but they too found familiar faces at Reunion. Inside the bustling tent, members of the Class of 1957 and their spouses enjoyed catching up with one another. At the Class of '57 table — designated by a shiny silver balloon shaped like the numeral 57 — Wolfgang Filusch and Alfred Jackson (both '57) held down the fort for the group, which boasted seven attendees who made the trek for their 50th class reunion. Jackson, who lives in Evanston, said he was glad he had come for the weekend, which featured a host of social activities, meals and "MBA Updates" — classroom refreshers on subjects from finance to entrepreneurship, taught by top Kellogg professors. "I'm enjoying it thoroughly," said Jackson. Filusch said he and his wife had flown in from Fort Collins, Colo., where they had been living for the past two years. So far, they had attended an MBA Update led by Finance Department Chair Janice Eberly, the Kellogg School's John L. and Helen Kellogg Distinguished Professor of Finance. 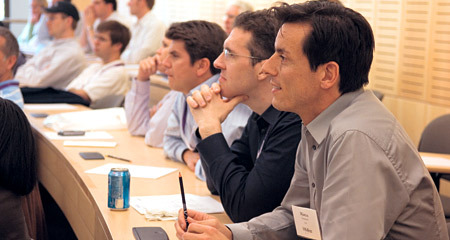 With seven MBA Update sessions held over two days, alumni were treated to the insights of Professors Eberly, Steve Rogers, Daniel Diermeier, David Dranove, Lakshman Krishnamurthi, John Ward and NU Professor William White. Each led sessions lasting from 75 to 120 minutes. With topics like "Is the Global Economy Out of Balance?" and "Entrepreneurship and Its Importance to the American Economy," the updates delivered on their promise to showcase some of the latest thinking on important business topics. Eberly, for instance, shared her insights on the implications of the U.S. economy's debts and deficits. Using historical data to trace the development of the country's current fiscal condition, she outlined the reasons why capital continues to flow into the U.S. despite facts suggesting that the country should be treated like a bad credit risk, now that its debt is some $8.8 trillion and growing. Reputational management was on the agenda too. Diermeier, the IBM Distinguished Professor of Regulation and Competitive Practice, explained how fast-changing risks were forcing companies to develop formal processes and capabilities for identifying and evaluating future trends and emerging issues related to reputational risk. Even before Reunion, Kellogg alumni were buzzing with anticipation. The school partnered with alumni clubs in key markets to generate extra enthusiasm for the Evanston gala weeks before it happened. In another session, Dranove, the Walter J. McNerney Distinguished Professor of Health Industry Management, provided insight into the U.S. healthcare crisis, offering suggestions for addressing the costs, quality and access to care. Under consideration were consumer-directed healthcare and quality report cards. Alumni also showered some attention on professors — particularly Sergio Rebelo, the Tokai Bank Distinguished Professor of International Finance. In naming him the Alumni Professor of the Year, graduates continued a tradition dating to 1988. The award honors a professor who is credited with having the most influence on the professional life of alumni. Rebelo expressed his thanks and related a story about his belief in the power of education to effect change, drawing from classical Greek history. "Not to compare us," said Rebelo, "but when Plato was an old man and frail, his servant asked him why he kept teaching. Plato explained that he was able to learn from his masters and considered himself really lucky to have time to think about remaining problems." One of the scholar's students was Aristotle, proving how a teacher can touch many lives by passing along knowledge. The weekend's participants enjoyed more lighthearted diversions too. Many attended Special K, the annual student-produced song and sketch comedy revue. Always popular, this year's production was a send-up on the school's rigorous academic focus. Titled, "The Inconvenient Truth," the show fretted about the supposed erosion of student social life as scholarship in the MBA program curtailed late-night extracurricular activities. With amusing video clips as well as live dramatic performances and choreographed dancing, Special K again demonstrated how multifaceted and talented Kellogg students are. Even Dean Dipak C. Jain got into the act for a few cameos, including one as a taxi driver. "I liked the fact that the dean was in some of the screen parts," said Filusch. "He was a good sport." So were the alumni, coming back — and giving back — to Kellogg in record numbers. Reunion 2007 represented the largest yet for Kellogg, said Associate Dean and Director of Development and Alumni Relations Roger "Whit" Shepard, who also noted that alumni gifts associated with Reunion tallied more than $5 million so far. 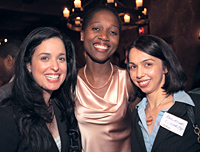 Several classes set Reunion giving records, including the Classes of 1967, 1987, 1992 and 1997, according to Stephanie Blackburn Freeth '02, director of planned and major gifts. The first Kellogg reunion occurred in 1977 and attracted about 100 graduates for an engaging but modest program of events. Over time, the number of alumni returning to campus grew, with significant increases since 2002 when the school redoubled its alumni outreach. Recent years have seen more than 1,000 graduates and their families come back for the event. This year's attendance broke all previous Reunion records. While looking back on their Kellogg experiences with their classmates, attendees also gained new perspective on the Kellogg School's recent successes as well as a glimpse at some future plans thanks to Dean Jain's "State of the School" address on Saturday. Said Dean Jain to several hundred alumni gathered to hear him, "The contributions and support of people like you is what makes this institution great."